In April, Harvey L. Massey, chairman and CEO of Massey Services, received the distinguished national Horatio Alger Award for 2016. Each year, the Horatio Alger Association honors business and civic leaders who have succeeded despite facing adversity and who are committed to both philanthropy and higher education. The award is fitting for the native of Melville, La., (population 1,900) who came from a humble upbringing to build Massey Services into a hugely successful pest management business. Horatio Alger Jr. was a prolific 19th century American author, known for his many young-adult fiction novels about impoverished boys and their rise from humble backgrounds to lives of middle-class security and comfort through hard work, determination, courage and honesty. Massey has always lived by the motto “to whom much is given much is expected” and he has become one of Central Florida’s leading philanthropists. He and Carol, his wife of 52 years, are ardent supporters of the arts and education. Moreover, volunteerism is one of the key touch points in the company’s guiding philosophy; Massey and team members are deeply involved with activities and organizations in the communities it serves. Some of the organizations in which Harvey Massey has served include chair of the Orange County Arts and Cultural Affairs Task Force; vice chairman of the Expressway Authority; chairman of United Arts; and chairman of the Rollins College Center for Advanced Entrepreneurship Program. Additionally, he currently serves on the Board of Directors of the Edyth Bush Charitable Foundation. Harvey Massey in front of the steps of the U.S. Supreme Court in Washington, D.C. The Horatio Alger Association honored Massey and 12 other new Members during its 69th Annual Awards Induction Ceremonies in Washington, D.C., in April. 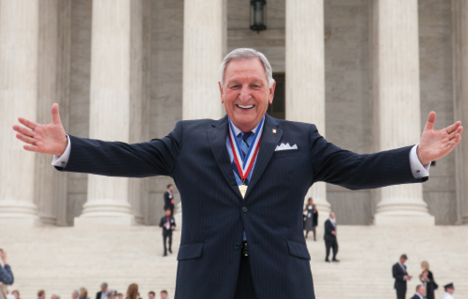 Massey said “not in my wildest dreams” did he think he would one day receive the Horatio Alger Award in the hallowed halls of the U.S. Supreme Court. “While I honestly don’t spend a great deal of time looking back, I am thankful to have had the opportunity to work with great mentors such as O. Wayne Rollins at Orkin and Carlos Cantu at Terminix, both of whom have also received the Horatio Alger Award,” he said. One of the most important functions of the Horatio Alger Association is its scholarship program, and 106 national scholars were recognized alongside the 13 new Alger Award winners in April. Since the establishment of its scholarship program in 1984, the Horatio Alger Association has afforded more than 22,000 students the opportunity to pursue a college education. These exceptional young scholars — acknowledged for their unwavering commitment to continuing their education and serving their communities despite facing incredible hardships — were recognized at the awards ceremony and interacted with Horatio Alger Members, many of whom will serve as mentors as the scholars enter college.